EAGLE EYE SUNGLASSES - Redtail Style with durable and lightweight nickel silver frame, spring hinges, soft non slip silicone nose pads and soft temple tips. 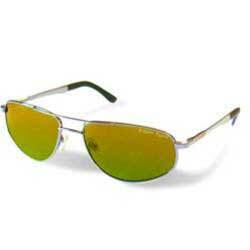 EAGLE EYE Polarised Selective Transmission (PST) SUNGLASSES are the most advanced sunglasses ever! Incorporating the unique Polarized Selective Transmission lens, PST developed by the NASA Jet Propulsion Laboratories from studies on the interaction of outer space sunlight, lasers and welding arcs with the human eye. Based on the physiology of eagle eyes, EAGLE EYE PST SUNGLASSES not only protect your eyes from all the suns radiation, they actually enhance your vision enabling you to see more clearly in normal, foggy, hazy or cloudy sunlight conditions.